Good news everyone! 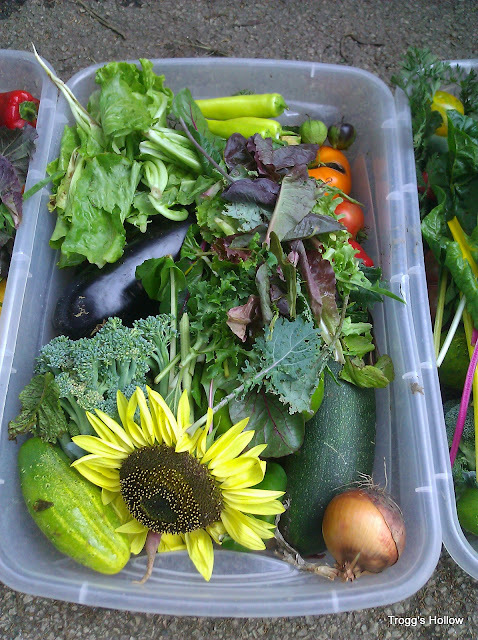 We are now accepting applications for our 2015 CSA shares. If you are interested in becoming part of our 2015 farm family and receiving a weekly (or bi-weekly) share of wonderfully fresh vegetables, read on. Our program will go from early-June for 18 weeks through October with an extra bonus week or two if the season has been good. We are hoping to to supply around 90 shares this year. This year we will again be offering two share sizes to better accommodate different appetites and budgets. Full shares will be a weekly 1/2 bushel (17.6 liters) and half shares will be a bi-weekly 1/2 bushel (17.6 liters). Full shares are set up to be enough for a family of 4 for a week, however we have several current full shareholders who are single or couples. Half shares are the same amount but would need to be stretched over two weeks. Half shares work great for anyone that wouldn't be able to get through a 1/2 bushel of fresh veggies in a week. The current pickup sites for 2015 will be in Elgin, Hampshire, Streamwood, Roselle, Wheaton, Berwyn, Logan Square, Sycamore, Dekalb-NIU, Huntley, Arlington Heights, West Dundee, Rockford and, of course, Poplar Grove. Additional pickup sites may be added if we have enough shareholders in a specific area. It's like this, we can create a pick-up site anywhere within reason, as long as we have a willing host with an acceptable location, and at least 5 whole shares each week (any combo of full and half shares) going to that location. We have several options depending on your personal tastes (and finances). We prefer option #1 because it provides the most money upfront to cover our season start costs and it costs you the least. The other options are setup to assure that we have adequate cash flow throughout the season and to break down your costs into more easily digestible pieces. $710.00 in two equal payments. $720.00 in four equal payments. $390.00 in two equal payments. $395.00 in four equal payments. This year we are accepting cash, checks or credit cards! Cash payments will have to be made in person. Credit card payments will be through an Square online invoicing. Please note: with credit card payments there will be an additional 2.75% fee assessed by the processing company. If you are signing up for one of the payment plans please send in all post dated checks at the same time. We will deposit these check on or after the corresponding dates. Once your application has been reviewed you will receive an invoice, and you can choose which form of payment you wish to use. So, if you’re still interested in becoming part of the farm family please complete our 2015 sign-up form and submit it to us. We will send you a confirmation email upon receipt and further communication once we have solidified our member list and pickup sites. Alright, great. Now fill out the form, yeah!